You may remember I had a lovely bunch of 12 and 13 year old girls over the other night and they made this cute little quilt. I didn't have enough sewing machines to keep all the girls busy. 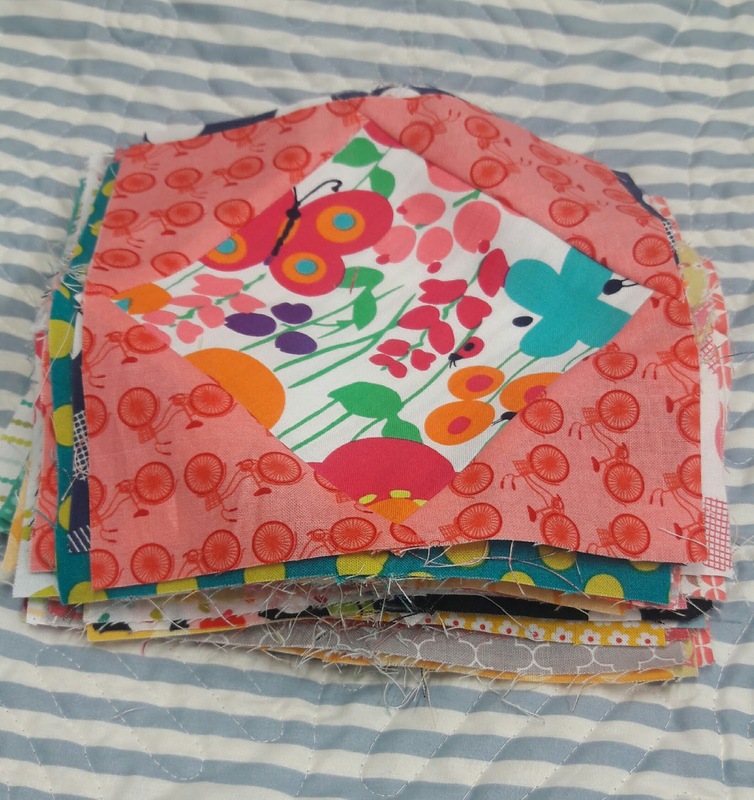 So I grabbed a big scrap bin, the ironing board and my Accuquilt Go. I chose two dies for them to use. First the 3" hst die and the 4 3/4" square on point. They had a ton of fun; picking scraps pressing them and running them through the Go. I was able to make these pretty square in a square blocks from all their cutting. I thought of putting them all together. I ran into two problems with that. 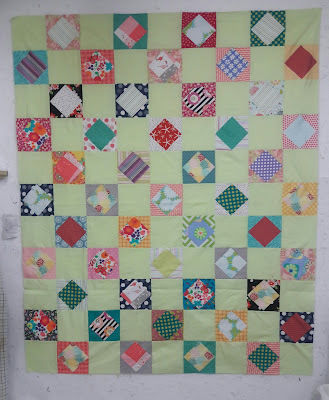 I didn't have enough blocks for a full quilt. And It was pretty busy. I found a pretty honeydew green in my stash and used it for an alternate block. It calmed things down and allowed the blocks to shine. 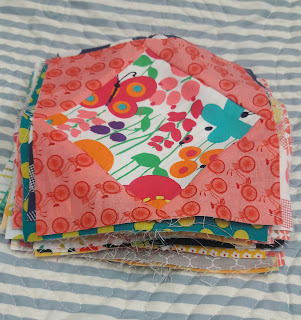 Just as I finished sewing the last row on my mind was milling over a new project. 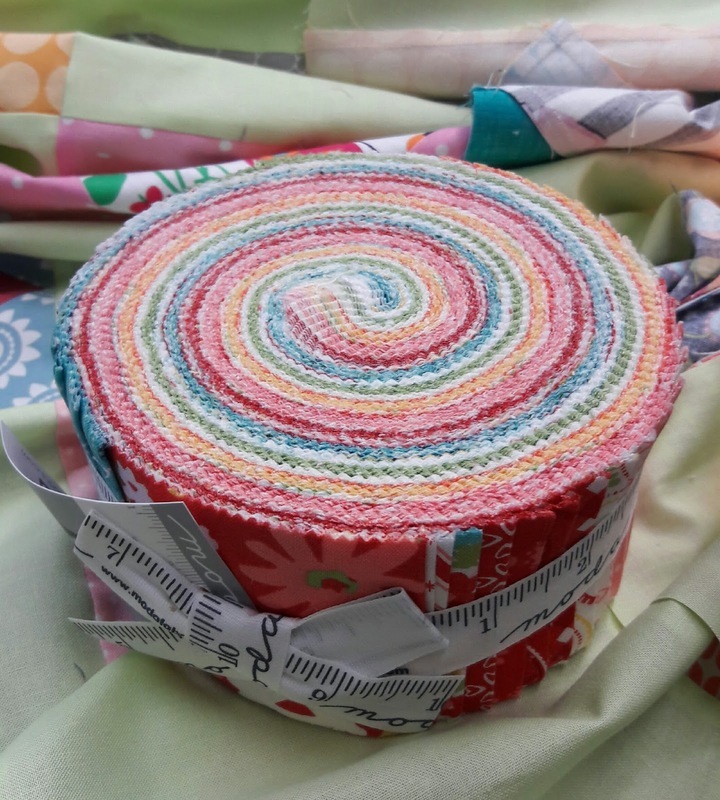 This pretty jelly roll of Momma's Cottage caught my eye. Doesn't it look so yummy there on the newly made flimsy? Time to dig in. Now it's your turn. What have you been digging into this week. Looking forward to seeing your yummy projects. Love the honeydew with your blocks,fresh and does make the blocks pop. What a fun way to engage the girls. Honeydew green fabric was a great idea. It really lets the blocks stand out a lot more. You came up with a great project for the girls to do. Now I wish I had been quilting more when I was a girl scout leader as I could have taught the girls. I'll bet the girls had a blast. Looking forward to seeing what you do with the jelly roll. Congratulations on the quilt top finish! That jelly roll sure looks beautiful. It'll make a wonderful quilt.